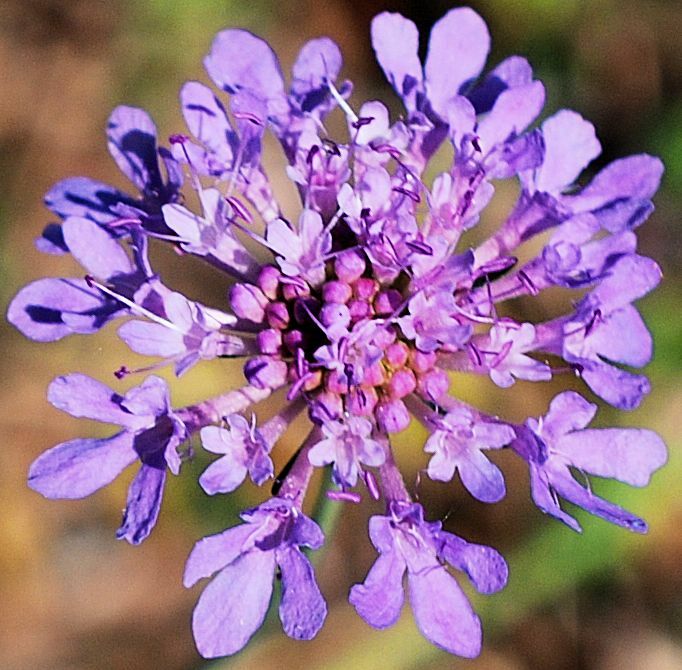 The flower is not fully open – the centre ring is folded over the stamens. It’s also sprinkled with drops of rain from a brief shower. 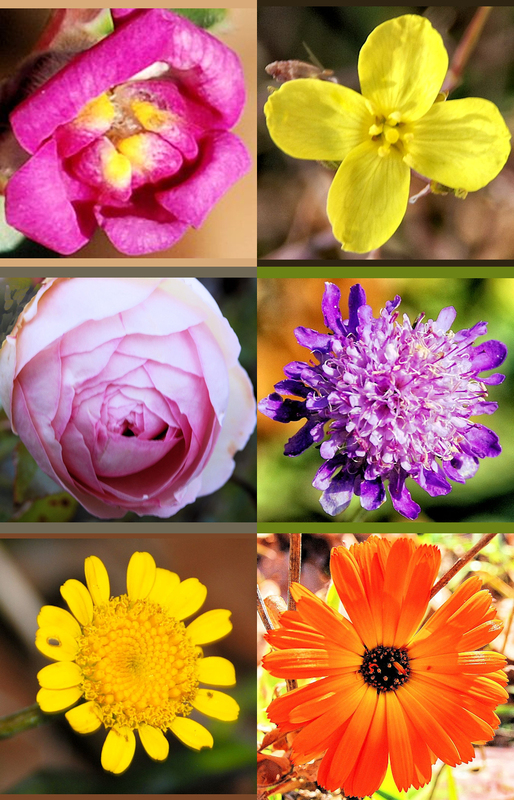 Here is a selection of some of the flowers still in bloom this relatively warm winter. 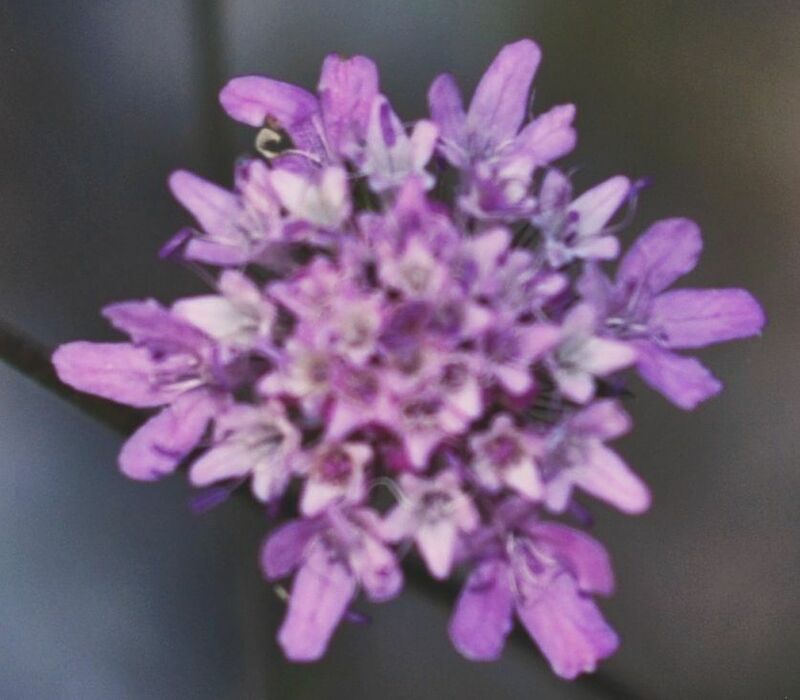 Scabious flowers, being organic, don’t follow quite the same principle as snowflakes. 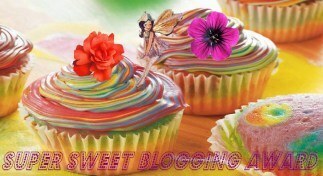 But look closely and there’s infinite variety on a theme – just like with snowflakes. And all in a wasteland flower, viewed with the naked eye. 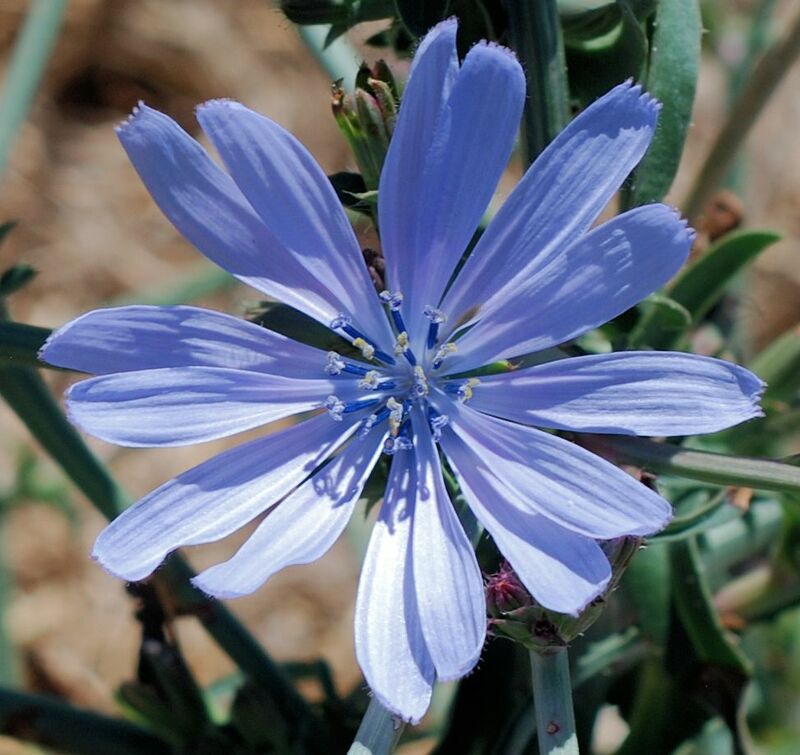 The flowering of wild chicory coincides with the hot weather. The stems are a stringy, nobbly mesh covered in buds, a number of which bloom each day to create a breath-taking early-morning display. Usually by mid-morning the day’s crop is so shrivelled it scarcely has any colour. But, for some strange reason, not today. 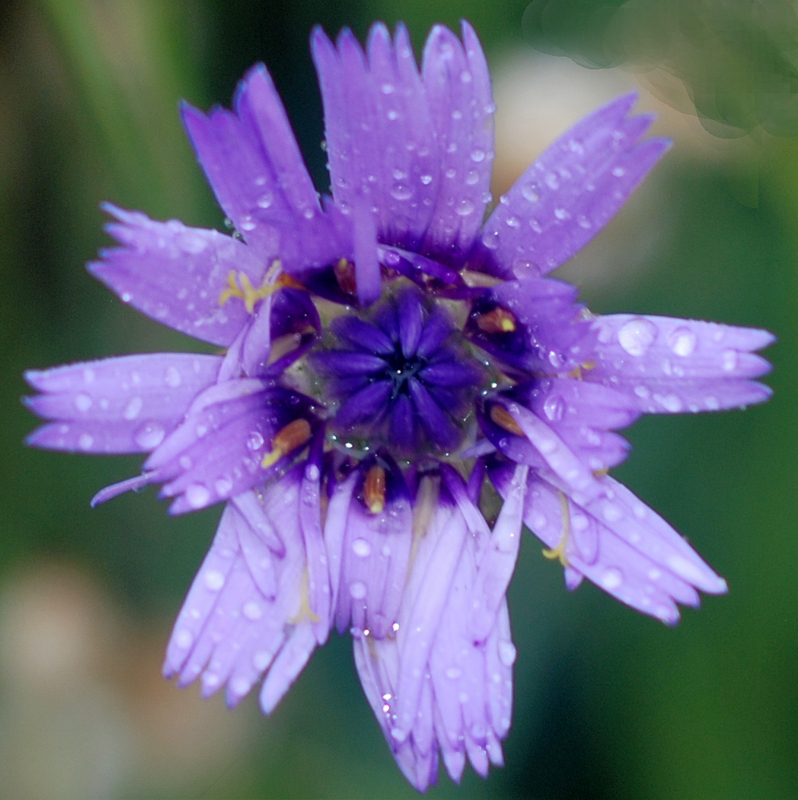 The chicory flowers have stayed open, so I took advantage. Chicory has a host of culinary uses, but for me it’s just a visual feast. 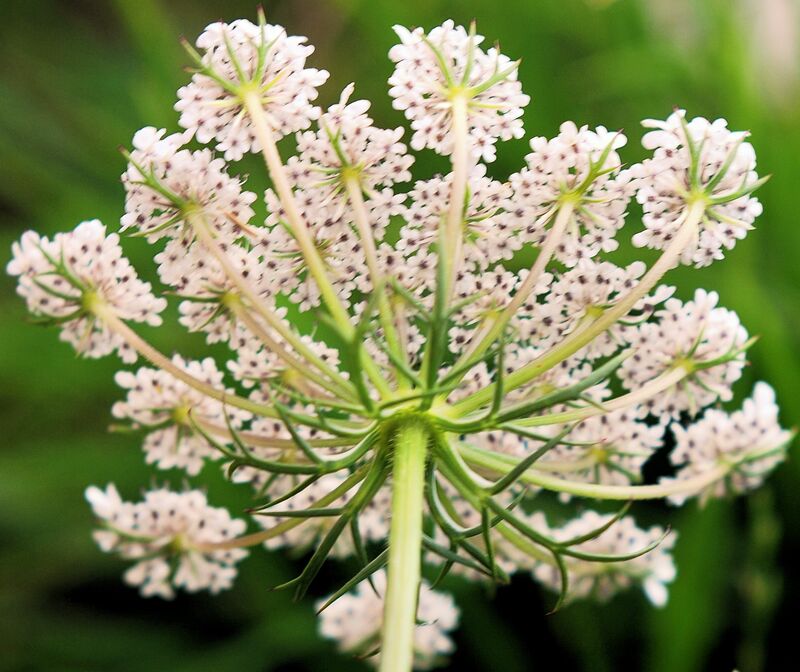 Queen Anne’s Lace is one of those lovely vague poetic names which can actually refer to more than one species of plant – in this case either cow parsley or wild carrot. 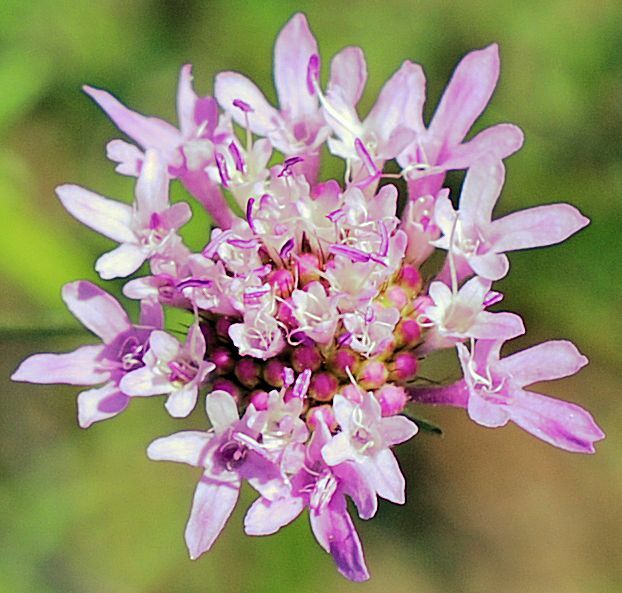 The photos here are of wild carrot, which has more compact flower heads and also a little red flower in the middle which is supposed to be Queen Anne’s blood from when she pricked her finger. However it was cow parsley which I had in mind when I wrote my novel Queen Anne’s Lace and featured the plant in a pivotal scene. I also meant the title to be a comment on the complexities of family relationships. 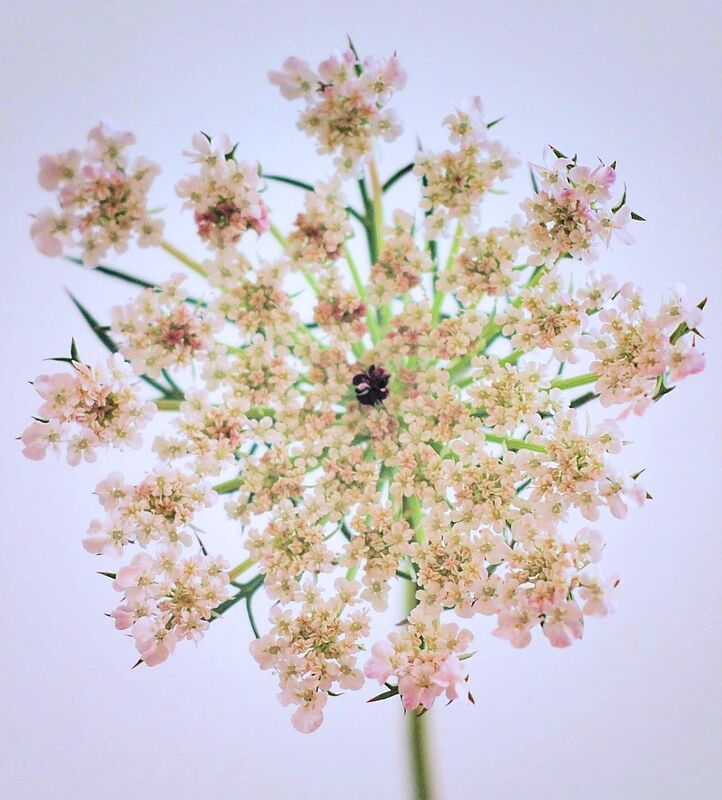 It was windy yesterday when I went to photograph the wild carrot blooms and the intricacies became a blur so I brought a couple of stalks indoors. 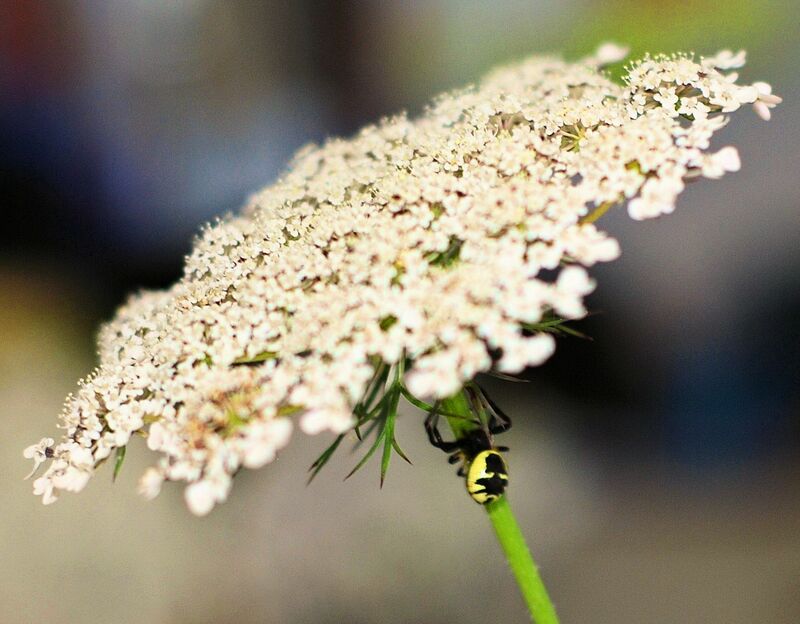 Almost immediately a very attractive spider dropped out from under one of the flower heads, raced across the work surface then, finding a precipitous drop, followed its silk all the way back to the flower! I’m not a serious enough gardener to understand let alone control hybridisation. 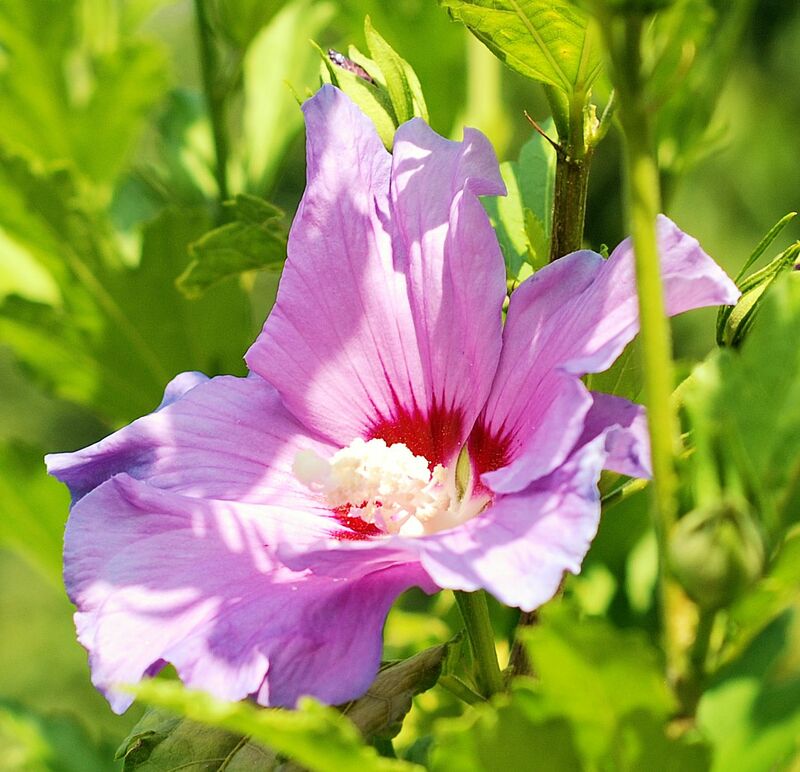 But I do know that our ‘trunk-growing’ hibiscus has produced hundreds of seedlings, and the flowers on those seedlings are larger and more finely marked than those of the parent plant. This is one of the ‘throwback’ hibiscus flowers, the first to open in the garden. 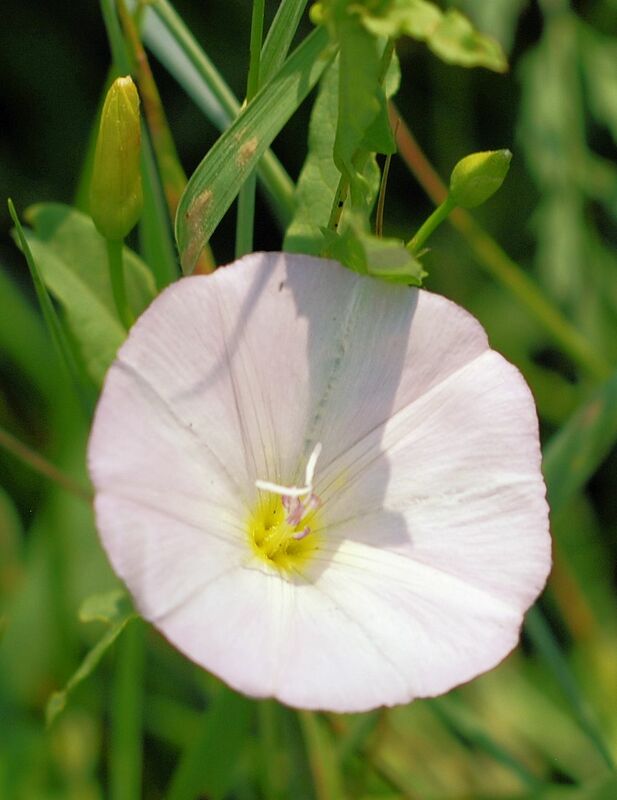 The young plants are sturdy, with good genes; we’re able to transplant them even when they’re quite big. They’ve filled many a gap and shored up many a sliding bank!